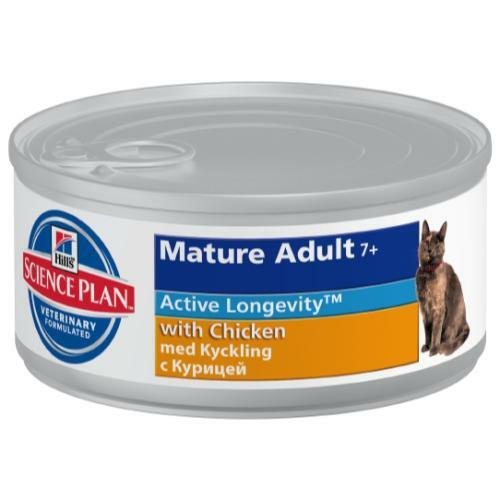 Hill's Science Plan Feline Mature Adult/Senior 7+ helps preserve kidney and vital organ function. Formulated with clinically proven antioxidants, omega 3s and reduced phosphorus. with Chicken (minimum Chicken 17 %): Chicken, turkey, pork, pork liver, maize starch, maize gluten meal, rice flour, soybean meal, wheat flour, animal fat, cellulose, digest, calcium carbonate, iodised salt, dried yeast, potassium citrate, dicalcium phosphate, DL-methionine, taurine, vitamins and trace elements. Calcium 0.0025, Carbohydrate (NFE) 0.066, Fat 0.057, Fibre (crude) 0.009, Magnesium 0.00017, Moisture 0.755, Omega-3 fatty acids 0.0009, Omega-6 fatty acids 0.0128, Phosphorus 0.0017, Potassium 0.002, Protein 0.096, Sodium 0.0012, Taurine 1050 mg/kg, Vitamin A 30700 IU/kg, Vitamin D 470 IU/kg, Vitamin E 85 mg/kg.